Looking for a PCB connector that is robust, shielded, and guarantees reliable contact? One that can ideally be scaled to your individual requirements as well? 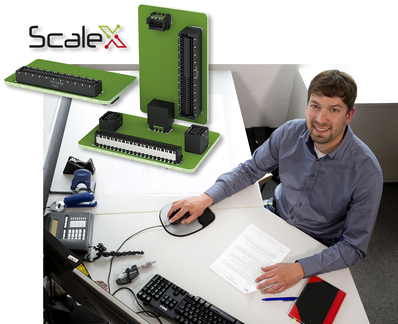 Our Zero8 product range was developed especially for demanding industrial applications while simultaneously offering ultimate scalability: This lets you customize the construction types, stack height, and number of contacts to meet your individual needs. The socket and plug are currently available in the mid-profile type and will also be available in the low-profile and angled versions in the future. 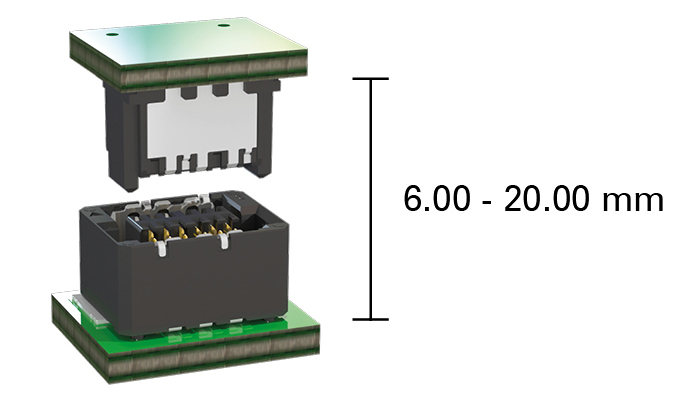 Thanks to their various structural heights, the Zero8 PCB connectors let you implement board-to-board distances of 6.00 to 20.00 mm. You can request a variable number of contacts between 12 and 80. The robust, double-sided ScaleX connection technology stands up to the difficult conditions found in industrial applications and guarantees secure contacting under exposure to mechanical stress such as shock and vibrations. In addition, it compensates for tolerances on the device side in all directions when connected. Thanks to its EMC shielding, your signals are perfectly protected against external influences in the industrial environment, and the material composition guarantees a data transmission rate of up to 16 Gbit/s. We have also thought one step ahead: The plug geometry is designed so the contacts cannot be damaged even in the event of faulty operation. 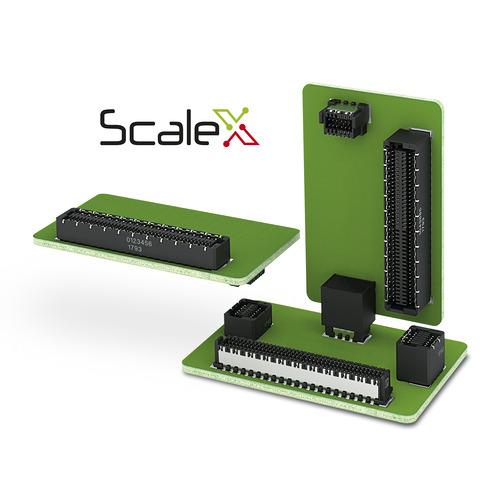 ScaleX – this brand stands for double-sided, robust contact technology in a plug connector system that can be scaled on a variable basis. Place your trust in reliable contacting, even under difficult operating conditions and challenges such as vibrations and shock! At the same time, you’ll enjoy the full flexibility that the plug connector system’s scalability provides with respect to the number of contacts, board-to-board spacing and orientation, as well as optional EMC shielding. 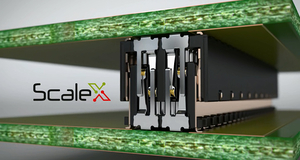 What does the new ScaleX technology offer? How does the double-sided contacting work? What data rates can you achieve with Zero8 connectors? What does the closed shield concept offer you? How flexibly can your devices be designed with Zero8 PCB connectors? This brief animated video provides you with answers to your questions. Take a quick look! 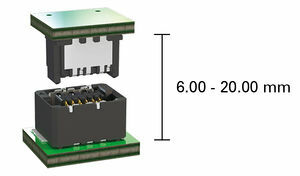 ept’s Zero8 plug connectors make it possible to implement board-to-board distances of 6.00 to 20.00 mm. The minimum possible board-to-board distance is achieved via plugging to the stop. The plug and socket can be variably inserted within a range of 1.5 mm to achieve the maximum possible board-to-board distance. The remaining 0.8 mm guarantee reliable contacting. The shielding concept on both sides guarantees interference-free, high-speed transmission in the industrial environment: The integrated shield material is especially suitable for components with high requirements in terms of electromagnetic compatibility and guarantees coupling inductance of max. 10 pH for the PCB connectors. 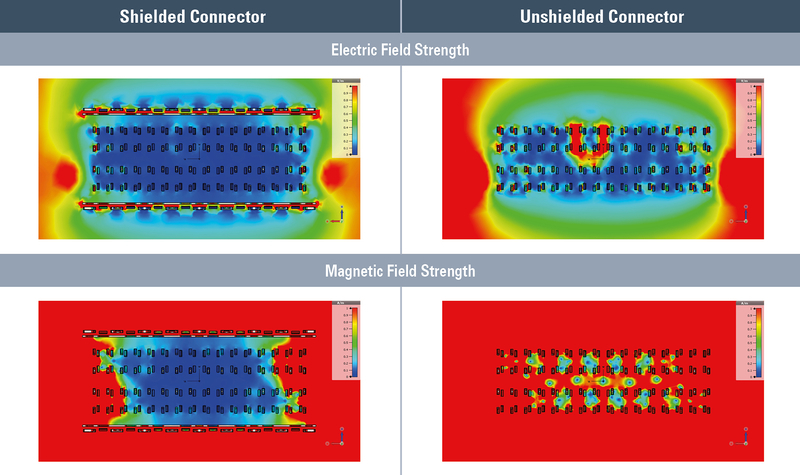 The coupling inductance makes it possible to simulate the influences of the electrical and magnetic field strengths on the plug connectors. 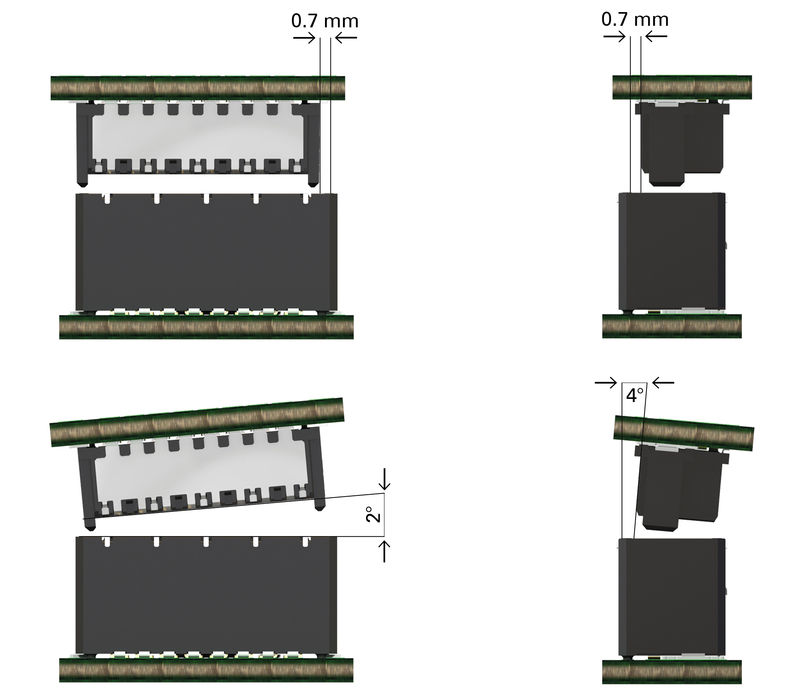 The large-scale shield concept reliably diverts interference currents via the multiple contacting points to both PCBs in the direction of the ground connection. The shield concept guarantees reliable contacting at all times for individual board-to-board distances of 6–20 mm with a secure-mating range of 2.3 mm. The shield concept not only protects the PCB connector against electromagnetic influence (interference suppressor) but also adjacent components when the PCB connector functions as a source of interference. How can Zero8 SMT PCB connectors be processed? The Zero8 PCB connector system is processed using surface-mount technology (SMT) and is therefore soldered directly onto the circuit boards. The connectors are typically shipped in tape-and-reel packaging, enabling fully automatic pick-and-place processing. Positioning pins on the underside of the Zero8 connectors guarantee exact positioning on the circuit board. ept also guarantees that the contacts’ deviation from coplanarity is max. 0.1 mm to ensure proper soldering during processing. How can circuit boards be connected with one another using the Zero8 SMT connectors? 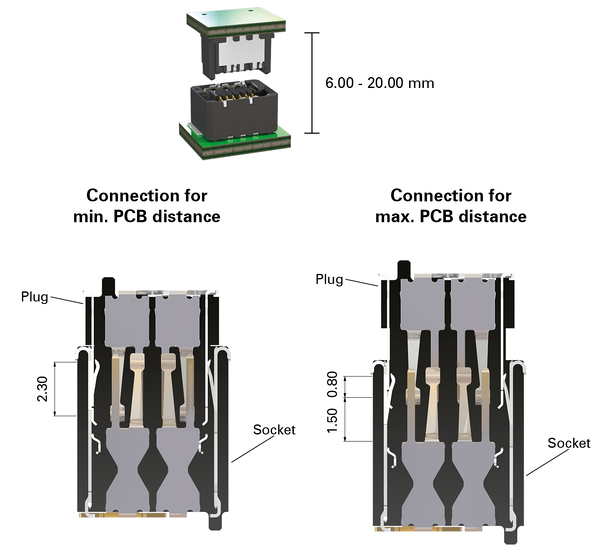 The different types included in the product range of Zero8 connectors make it possible to connect PCBs in parallel arrangements with stack heights between 6 and 20 mm as well as in horizontal or perpendicular arrangements. Which currents can be transmitted with the Zero8 PCB connectors? Thanks to the high-quality copper alloy and its excellent conductance values, up to 1.4 A can be carried at an ambient temperature of 20 °C with a 50-pin connector. These values are typically achieved with PCB connectors with a pitch dimension of min. 1.27 mm. What is the highlight of the new connection concept? Each half of the mating pair (plug or socket) contains both a male and a female contact. This double contacting approach guarantees reliable, gas-tight contacting in industrial environments and is resistant to external influences such as: shock, vibrations, thermocycles, corrosive gases, etc. Contacting on the roller surface with high-quality finishing guarantees at least 500 mating cycles and reduces abrasion of the surface when exposed to micro-movements. What does ScaleX technology stand for? For which data transmission rates are the Zero8 SMT connectors suitable? Simulations with the Zero8 plug connector system at 16 Gbit/s demonstrate an outstanding level of signal integrity. We can provide you with the S-parameters for your application simulations; please contact us regarding this at sales@ept.de. Which applications is the shielded version suitable for? Frequency inverters, power supply units, UPS systems, electric drives, switching devices, controllers, IO systems, medical devices, measuring technology, communications equipment, network technology, sensors, video transmission devices. Will the connection concept of the Zero8 compensate for tolerances in my application? The newly developed connection concept guarantees a high level of tolerance compensation during installation (angular offset of 2–4°, center offset of 0.7 mm) and also compensates for tolerances on the device side of 0.1 mm in the x and z directions and 0.8 mm in the y direction when connected.